If you want to buy a good cheap mountain bike, but are on a tight budget, then you’ve probably noticed the low price of Mongoose mountain bikes. While you can find them at some sporting goods shops like Academy Sports & Outdoors, the most common place that you see these cheap mtbs is at your local Wal-Mart. How Much Do Mongoose Mountain Bikes Cost? How Good Are Mongoose Mountain Bikes, Really? Who Makes Mongoose Mountain Bikes? I understand the appeal of these bikes, especially for people who are new to mountain biking or maybe people who are not really sure if this is the hobby for them. They are dirt cheap when it comes to mtb gear, with prices well under $200 for several models. For instance, Target sells some of these bikes with free shipping. They have attractive prices for sure, with a low of around $159 and a high of around $269 for the men’s models. The model in the image above is the Mongoose® Men’s Standoff 26″ Mountain Bike. It doesn’t look terrible, right? And the price I’m seeing at the time of writing this is $159.99 with free 2-day shipping. Sounds awesome, huh? Well, the reviews aren’t looking too great for this one. On the Target website at the time of this publication, there are 23 reviews and the average rating is a solid three stars. Of course, these cheapo models at Target don’t have the same quality as the higher priced options you see in some local bike shops. So, how decent are Mongoose mtbs? Well, you know the old saying that you get what you pay for? It definitely applies here for the most part. Those cheap models that you’re seeing at Wal-Mart and the like are the lowest end of Mongoose models and, in my opinion, definitely not worth the money. All it takes is a look around a few MTB forums and you’ll see plenty of newbie riders who took a chance on one of these and ended up with faulty brakes or seat issues. However, if you go with one of the more expensive, higher end Mongoose bike models then you’ll be fine. You might be wondering how you can tell the difference between the lower quality Mongoose bikes and the higher quality ones. Well, according to someone in this forum, the poor quality models all have a cartoonish version of the Mongoose logo. And the higher quality models feature a stylized M logo. So, keep that in mind as you shop for a new Mongoose mountain bike. Another good rule of thumb when it comes to finding the higher quality options from Mongoose is the store where you see it for sale – are you in a bike shop? If so, it’s probably a fine bike. are you in a Walmart or non-bike specialty retailer? If so, it’s probably not worth the money. This is a common question that I hear from new mountain bikers who aren’t really sure is a Mongoose mtb is the right option for them. Like so many great companies, Mongoose was founded in a garage in Simi Valley. Their first product was a BMX bike and they actually only sold BMX models for many years. These days, the company is owned by Dorel Industries, which is a Canadian company. If the name sounds familiar, it should, Dorel also owns Cannondale, Schwinn, and a few other bike brands. Dorel also owns Pacific Cycle, a company that designs, markets and distributes branded bicycles and other recreational products. They are based out of Madison, Wisconsin but it seems that they source their bikes and bike parts from Asia, specifically Taiwan and China (source). To give you a better idea of what you can expect from the ultra cheap models offered by Mongoose, we took a closer look at one of the models offered for sale by Target. 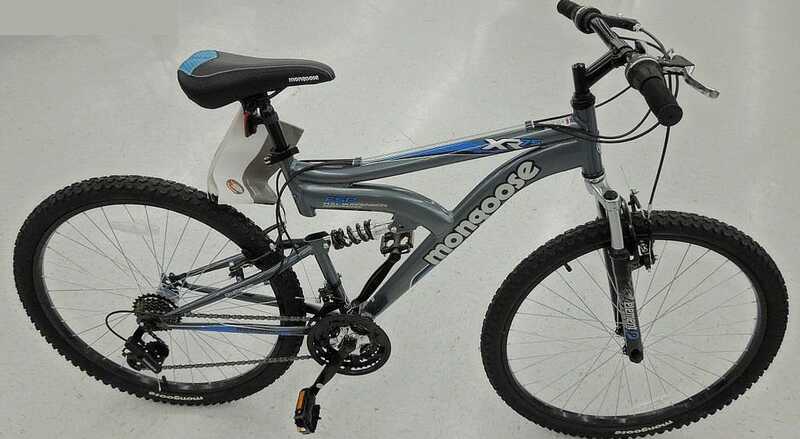 The model below has the most reviews on the Target website and it seems to be the second most popular Mongoose model that they sell. Coming in at around $160 for the retail price, this men’s mtb is definitely easy on the wallet. This is a full suspension mtb. Very affordable price, which makes it a good choice for teens who are new to this sport. If you were asking yourself, “how much do Mongoose mountain bikes weigh?” then you’d probably be surprised to learn just how heavy this thing is. It weighs a whopping 40 pounds! That is insanely heavy for a mountain bike! It also only supports 250 pounds, so it’s definitely a poor choice for heavier guys. Probably the worst thing about this model is that several owners reporting that it basically shows signs of excessive wear about five to six months into owning it. So, you can’t really expect it to last much longer than that. Of course, if you’re wondering about Mongoose bike quality then you’re probably not looking to spend high-end MTB prices, right? Do yourself a favor and spend just a little bit more than you would on that Wal-Mart Mongoose MTB and get something like the Diamondback Recoil FS 29er or one of the other best hardtail mtbs under $500 that I reviewed. In fact, Diamondback consistently makes some of the best good, cheap mountain bikes that money can buy. When shopping for your mountain bike, keep in mind that the most important thing is how it fits you. So, if you think that a cheap Mongoose MTB is the best fit for you, and you don’t mind taking a chance that it will be a lemon, then give it a try and let me know how it holds up for you. I’d love to share a good Mongoose bike experience here on Active Weekender but I haven’t had one myself.